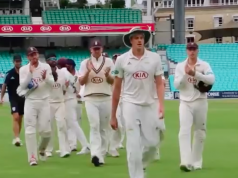 After a swelteringly hot day’s cricket that was more for the devoted lover of cricket than the casual fan, Sussex succeeded in taking only two wickets whilst Warwickshire scored 305 runs. Although the Bears need another 85 runs to avoid the follow-on, Sussex will not fancy their chances of taking another fifteen wickets on the final day. Warwickshire had begun this match as strong contenders for the LV= County Championship title. By the start of the third day they were equally strong contenders for an innings defeat. Now they look likely to hold on for a draw which will not help their title challenge or Sussex’s bid to avoid a flirtation with the relegation zone. Over the first two days, Warwickshire had conceded 600 runs to the Sussex batsmen on a pitch as brown and bare as any of the suntanned, bald pates in the Members’ Area. On the second evening, they had lost three early wickets, two of them to Steve Magoffin. The veteran Australian paceman managed to extract hitherto unseen life and swing from the previously benign conditions. Today, the Sussex bowlers toiled with little reward.despite the fact that, with Ian Bell departed for his Ashes stint via Spain, there are precious few Warwickshire batsmen with any semblance of decent form. Jonathan Trott and nightwatchman Chris Wright batted throughout the morning, battling hard early on against tight bowling by the Sussex attack. Both batsmen showed a liking for the leg side that often involved straying across their stumps. This kept the bowlers interested but also produced a steady flow of runs. Steve Magoffin was unable to reproduce the threat of the previous evening. Ashar Zaidi ,Matthew Hobden, Luke Wells, Peter Burgoyne and Ollie Robinson all did their best but the fourth wicket pair proceeded steadily along. Burgoyne got the odd ball to keep low bowling from the City end but Trott had his nose over the ball and his bat firmly down on it (the ball, that is, not his nose). He reached his fifty off 134 balls with just three fours . It was his first half century of the season and he seemed very much back in the groove. Even the presence of two short mid-wickets failed to prevent him from exploiting his favourite scoring zone. When Ollie Robinson briefly extended this to a short leg, two short mid-wickets and a silly mid-on, a stalemate was achieved but Trott is not noted for his impetuosity when the sun is shining and the wicket is flat so the ploy failed to bring Sussex the wicket they needed. After lunch, Chris Wright proceeded to his fifty off 107 balls with six fours. Then, from nowhere, Matthew Hobden moved a good length ball back at Jonathan Trott and bowled him for 68. The Bears were 170-4 and as the temperature rose, so briefly did Sussex’s hopes. Laurie Evans started like a man playing for his place and took time to settle down whilst Chris Wright continued to do his excellent impersonation of a front-line batsman. Wright survived a difficult leg-side stumping chance off the persevering Burgoyne but then pushed a harmless looking delivery straight back to Ashar Zaidi. His 65 was off 152 balls and had swallowed up 205 of the minutes that Warwickshire needed to survive to escape with a draw. His season’s batting average was reduced to a mere 45 by the dismissal. Phase two of Warwickshire’s resistance now began with Evans and ex-Sussex man Tim Ambrose settling in either side of tea to compile a big stand. Sussex skipper Ed Joyce tried his best to create a breakthrough with some imaginative field settings. The four close-up men in front of square on the leg side made a re-appearance but to no avail. The pair batted through the final session, Evans completing his first century for two years just before the close, off 197 balls with 15 fours. Ambrose finished on 65 off 130 balls. The partnership is so far worth 160. There were frequent drinks breaks. Ex-Warwickshire captain Tom Dollery, grandfather-in-law to Jonathan Trott, allegedly once said: “Drinks? Why do they need drinks? When we were in the desert in the war, we had two pints of water a day – and one of those was for the vehicle.” But even he might have called for refreshment today. Hove with its cooling sea breezes must have seemed like a distant and enchanting prospect to the perspiring Sussex bowlers and fielders. The combination of an unchanged weather forecast and a slow pitch that shows no sign of breaking up suggests that there will be more of the same tomorrow.